Basic environmental protections for Massachusetts residents have unraveled in the last 15 years as deep budget cuts and shifting political priorities take hold. The state has slashed bacterial testing of lakes, rivers and other surface water by more than two-thirds in the last decade, according to state-reported data analyzed by The Eye. Inspections of contaminated properties and waste and water sites, meanwhile, have dropped 24 percent from fiscal year 2001. 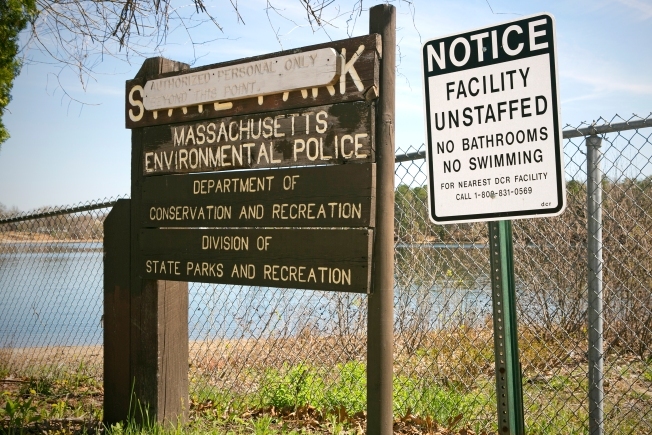 The state Department of Environmental Protection hasn’t collected water-quality data on the Neponset River since 2009, the agency confirmed. The Neponset River Watershed Association and other environmental groups say they are worried boaters and swimmers across the state are being exposed to high levels of bacteria or other contaminants. An illegal discharge from a pipe connected to the state prison in Concord, first ordered to be fixed six years ago by DEP, was still apparently leaking into the Assabet River in Concord in December, when state tests found the pipe spilling elevated levels of E. coli bacteria, often a marker for sewage. DEP spokesman Joe Ferson said the agency is working with the prison to solve the problem. Field-Juma said there isn’t enough state staff to keep after polluters. The state’s current $94 million annual budget for environmental oversight – including DEP and its parent agency - is 29 percent lower than it was in 2001 after adjusting for inflation, according to the non-partisan Massachusetts Budget and Policy Center. Gov. Charlie Baker has proposed a further 9 percent cut in the year ending in June 2017. “Budget cuts of this magnitude do not just trim the fat, they cut into muscle and bone,” according to Kenneth L. Kimmell, a former DEP commissioner, who is now president of the Union of Concerned Scientists. He said the cuts “threaten DEP’s ability to perform its core mission,” including protecting rivers, lakes and drinking water. Environmental spending has fallen while the total state budget is up by more than 30 percent (also inflation-adjusted) since 2001. Outlays elsewhere in the budget have soared in that time, including health-care costs that have almost doubled. Before then, state spending wasn’t classified the same way, making comparisons with earlier numbers difficult. The state’s Executive Office of Energy and Environmental Affairs, DEP’s overseer, is “committed to protecting, preserving, and improving the Commonwealth’s natural resources and open space,” according to a statement it issued in response to questions. Despite inheriting a billion-dollar budget deficit, Baker’s administration has invested more than $240 million in capital spending for environmental protections, such as tree-planting programs and Hull’s Nantasket Beach restoration, according to a statement from his press office. Still, many state-park facilities are crumbling or shuttered. Springfield’s Lake Lorraine State Park has gone unstaffed for several years, and the state has stopped testing water quality there. Windsor State Forest in the Berkshire highlands hasn’t been staffed since 2009. Local residents say the state has stopped creating a swimming hole there each year behind a dam. The state’s parks and recreation budget has fallen 36 percent to $90.4 million since 2001, according to the budget center. Massachusetts - where the Charles River once ran so foul it inspired the hit song “Dirty Water” - became an innovator in the national environmental movement after key federal anti-pollution laws were passed in the 1970s. The state started a program to reduce business dependence on toxic chemicals, worked to better identify and clean hazardous waste sites and enacted one of the most protective laws in the country for wetlands, which improve flood control and nurture fish. The Bay State is still seen as a leader in some areas. Last year, it was named the nation’s most energy-efficient state by the American Council for an Energy-Efficient Economy, a nonprofit funded by government, industry and foundations. Since hitting a low in 2012, the state environmental budget was boosted by about $18.1 million, including increases for enforcement, budget center numbers show. But about half of the total increase would be wiped out by the governor’s proposed cut for next year, while some of the state’s front-line sentries to detect and reduce basic pollution are already disappearing. A state environmental arm, the Office of Technical Assistance & Technology, visited 250 businesses a year in the early 2000s, providing advice on reducing energy, toxic-material and water use, according to Rick Reibstein, the office’s former outreach and policy manager, who left with scores of other environmental employees in an early retirement program in July. The state told The Eye 50 businesses are now visited a year. On the campaign trail two years ago, Baker pledged to increase spending on the environment to 1 percent of the state budget over the course of his first term. Neither the current environmental budget nor the governor’s proposal approaches that figure. The spending cuts, combined with a gubernatorial executive order last year requiring state agencies to cull “confusing, unnecessary, inconsistent and redundant” regulation, has environmentalists worried that more protections are about to be stripped. Baker has required agencies to focus in part on axing regulations that are stricter than federal law. Several state environmental laws fit that description. For example, Massachusetts has strict drinking water standards for perchlorate, a chemical found in fireworks and explosives that can interfere with thyroid function, possibly leading to development and metabolism problems. The federal government has no standard, although it is developing regulations. “When agencies’ budgets are cut so severely, year after year it drastically diminishes their ability to fulfill their mission,” said Erica Mattison, legislative director of the Environmental League of Massachusetts, an advocacy group. A report from the League and five other groups last month gave the Baker administration a "C" grade for energy and environmental protection. The state also went beyond national mandates with a 2006 law aimed at controlling mercury, which can cause developmental problems in young children. The law required manufacturers to meet a 70 percent recycling rate for fluorescent lights containing the metal by the end of 2011, or pay up to $1 million if targets weren’t met. But in 2014, the legislature amended the law, abolishing the 70 percent target and setting unconditional fees of $300,000 a year to pay for recycling. Only 34 percent of fluorescent lights were recycled in 2008, the last year of data available, according to the Product Stewardship Institute, a Boston-based non-profit. John Reinhardt, a recently retired DEP employee who worked with the mercury program, said the money isn’t being collected. The end result, he said, is a lack of incentive to recycle the toxin, which that can eventually be absorbed by fish and poison humans. DEP spokesman Ed Coletta confirmed money is not being collected and said the agency is developing new regulations for the program. Nowhere are the funding cuts and changed priorities starker than in water-quality monitoring. While the state is working to reduce a backlog in analyzing river data, it is still behind, environmentalists say. In 2010, Sam Copeland, a ninth grade student on a community-service project for his earth-science class, was in a canoe on the Assabet with his mother when they discovered a broken pipe discharging a stream of warm, milky colored liquid. “It smelled like wet dog,’’ said Sue Beede, Sam’s mother. DEP and federal environmental officials inspected the pipe, found high levels of bacteria and ordered the prison to fix the problem, with fines of up to $25,000 a day if it didn’t, according to the state’s enforcement order. But in September of 2014, a volunteer river cleanup crew found latex gloves, a toothbrush and other possible flush-aways from the prison piling up near the pipe, which was trickling warm water. The state was called again and found lower, but still unacceptable bacteria counts, according to another enforcement order. DEP’s Ferson said the pipe was last tested in December, when levels were elevated but much lower than in 2010. The state prisons department has been working with the agency to eliminate any elevated bacteria levels, a spokesman said. Field-Juma, the OARS leader, said the state was not proactive in dealing with the problem and it “has dragged on far too long.” She said the Assabet has lots of visitors that spot and report problems. “But what about those places that don’t?” she asked. The Eye (eye.necir.org) is the online publication of the New England Center for Investigative Reporting, a nonprofit news outlet based at WGBH (PBS/NPR Boston) and affiliated with Boston University. NECIR intern Ellen Cranley contributed to his report.